Continuing my occasional series as I work my way through the late Terry Pratchett’s delightful Discworld series, one novel at a time. Today’s entry is on the 35th book, Wintersmith. Plot: Tiffany Aching has been learning from various witches the art of being a witch so she can return to the Chalk and be a witch there. Unfortunately, while witnessing a Dark Morris Dance for the first time with her current mentor Miss Treason, Tiffany can’t help but join the dance that ends summer and welcomes Winter. This brings her to the attention of the Wintersmith. And he falls in love with her, or at least as much as a season can understand such things. Can Tiffany figure a way out of being a replacement for a virtual goddess? Commentary: I want to start off by commenting that, in general, I didn’t care much for Tiffany Aching the first time around, and cared for her even less the second time around. Tiffany’s adventures replaced Granny Weatherwax and company’s, and she seems more of a cypher than anything else. At the end of The Wee Free Men, she adopts a very Granny-ish attitude towards Roland, the Baron’s son, when he comes to more or less apologize, and then antagonizes him further for no clear reason. In A Hat Full of Sky, Tiffany didn’t have much of a personality of her own. She was clever, but the witch world seemed a lot nicer than it used to. Granny Weatherwax seemed outright pleasant to Tiffany for no clear reason. Granny gave both Magrat and Agnes hell during their training periods, so why should she be nice to Tiffany, who’s even younger and less trained than either of the other two? Plus, I know I’ve been slowing down on this series. There aren’t many books left. We’re looking at, basically, two more for Tiffany, two more for Moist von Lipwig, one for the wizards (sort of), and one more for Sam Vimes. 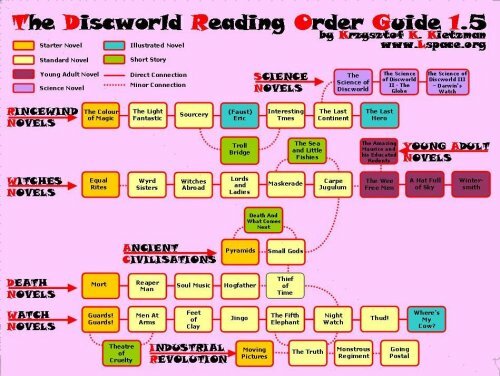 That’s all Pratchett wrote for Discworld aside from some silly science books and short stories. Part of my slow down is due to a lot of outside factors, but I started off doing one of these books a week and have gotten more sporadic since then. But among the big reasons for the slow down was the general knowledge that Tiffany’s adventures were making up the biggest number of remaining books, and the first two were less than impressive. The first one itself wasn’t too bad, but the second one was the most watered-down Discworld book I’d read. Granted, Tiffany’s adventures are for younger readers, but I can’t exactly shut off my adult critic when I read these books. Not completely. So, I was surprised that I enjoyed Wintersmith more. This one felt more like a Discworld book. Death had a pair of amusing scenes. Granny Weatherwax was acting more like Granny Weatherwax. Nanny Ogg was back as one of Tiffany’s revolving mentors! And even cleaned up a bit for younger readers, Nanny is a hoot and a half. There was even a cameo from Mr. Groat from Going Postal. And possibly Magrat if she was the unidentified woman with the red nose that helped Tiffany wake up. Plus, Pratchett managed to make Roland and Tiffany’s relationship a bit more…sane? Roland is 15 and next in line to become Baron of the Chalk. His father is sick and his two aunts are making him miserable. Tiffany turns 13 in the book, and the two exchange letters frequently. Tiffany apparently was a good influence on Roland, who has taken up reading and wants to be a smart man for when he takes over the Chalk. He just has to hope his father hangs in there until he’s 21 or else the aunts run things. Roland actually is rather bright here, learning a lot to stay ahead of his aunts and then to assist the Feegles in a mission to the Underworld. Well, one of them anyway. Tiffany made him a better person. The book is divided into two plots, one of which informs the other. Witchcraft isn’t really about magic. Silly witches like Mrs. Earwig think it is, but Granny, and by extension Tiffany, know better. Miss Treason teaches Tiffany about theatrics, and that’s important when the Wintersmith falls in love with a mortal. The Wintersmith isn’t evil. He isn’t good either. He’s a season, and he doesn’t understand what it means to be human. Tiffany has to find a way to banish him while Roland retrieves Lady Summer from the Underworld. Roland’s end of things has a lot of elements from Greek myth strewn in. Luckily, Roland knows a lot of that thanks to his reading up on Epheban myth. With the Feegles guiding Roland and the senior witches advising Tiffany, they can’t lose. The book ends with a mild cliffhanger, as Tiffany asks for pointers from Granny on how to eliminate pain for the Baron and keep the aunts out of power. The Baron doesn’t approve of witches, but as Tiffany notes no one approves of witches until they need one. NEXT BOOK: We’re going back to Ankh-Morpork as Moist von Lipwig takes over the Royal mint and the City’s bank. Be here soon for Making Money.